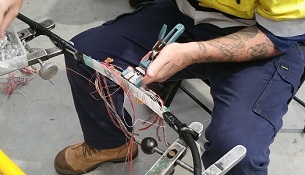 This course is designed for participants to achieve the required skills and knowledge to carry out cable fault repair (using electronic fault location instruments) and telephone service installation in the Telstra network. It includes joint metallic conductor cable in Telstra underground pits and jointing or above-ground enclosures‚ installation of cross connections (jumper wire) in Telstra exchanges, pillars and cabinets, and work on the Telstra side of customer main distribution frames. This course will be delivered in ten full day face-to-face training sessions in one of the MILCOM training centres or at a mutually convenient and suitable location‚ for a sufficiently large group of participants.